Their discovery suggests that doctors should examine bronchiectasis patients for a range of allergies, since the treatment for allergies already exists and controlling them could prevent the bronchiectasis from worsening. Bronchiectasis is a chronic disease in which parts of the airways have enlarged, due to irreversible damage to the lungs. Patients find it hard to cough out phlegm and are more prone to bacterial, viral or fungal infection. These complications can be fatal if left untreated, and the disease itself has no effective cure. Led by Assistant Professor Sanjay Haresh Chotirmall from the Lee Kong Chian School of Medicine (LKCMedicine) at NTU, the team included researchers from Tan Tock Seng Hospital, Singapore General Hospital, Changi General Hospital, National University of Singapore, Agency for Science, Technology and Research (A*STAR), National University of Malaysia, and the University of Dundee in Scotland. Their findings were published in the peer-reviewed medical journal American Journal of Respiratory and Critical Care Medicine on 1 April 2019. They assessed fungal infection in over 200 bronchiectasis patients from Singapore, Malaysia and Scotland. While previous bronchiectasis research focused on non-Asian populations, this new study matched patients in Asia (Singapore and Malaysia) to patients in Europe (Scotland) in terms of age, gender and the severity of bronchiectasis. The matching of patients allowed researchers to control the influence of these factors and hence show that the types and causes of allergies associated with bronchiectasis vary across regions. They found that overall, bronchiectasis patients have high allergy rates to fungi and the common house dust mite. The study showed that 58 per cent of bronchiectasis patients were sensitive to at least one allergen, compared to a group of patients with allergic rhinitis (also known as hay fever) where 27 per cent were sensitive. While there is no data on the prevalence of bronchiectasis in the Singapore population, the disease sometimes coexists with chronic obstructive pulmonary disease (COPD). Published studies elsewhere showed that globally, bronchiectasis among COPD patients can range between 4 per cent and 69 per cent*. According to data from Singapore’s Ministry of Health website, COPD ranked 10th among principal causes of death in 2017**. Although allergy is well studied in respiratory diseases such as asthma, the link to bronchiectasis has been confined to patients in single locations and in smaller cohort sizes. In addition, while the genetic make-up of bacteria or viruses is well-known, few have looked at the DNA sequencing of the fungal community in bronchiectasis patients, which was performed for the first time by the same group of authors from Singapore and published in the European Respiratory Journal in July 2018. The NTU-led study compared over 100 patients each from two regions. Bronchiectasis patients in Singapore and Malaysia showed greater sensitivity to the house dust mite and major allergens of the species Aspergillus fumigatus, while patients from Scotland showed greater sensitivity to the minor allergens of Aspergillus fumigatus. A major allergen refers to a specific protein of the fungus where a detected allergy is more common, and a minor allergen is one where the allergy it causes is less common. An example of intervention, if patients are found to be allergic to the house dust mite, would be to reduce house dust mite in their home, through measures such as using allergen-proof bed covers, or regular vacuuming. The research, spanning over 30 months, was funded by a Transition Award from Singapore Ministry of Health’s National Medical Research Council, which Asst Prof Chotirmall received in 2016. 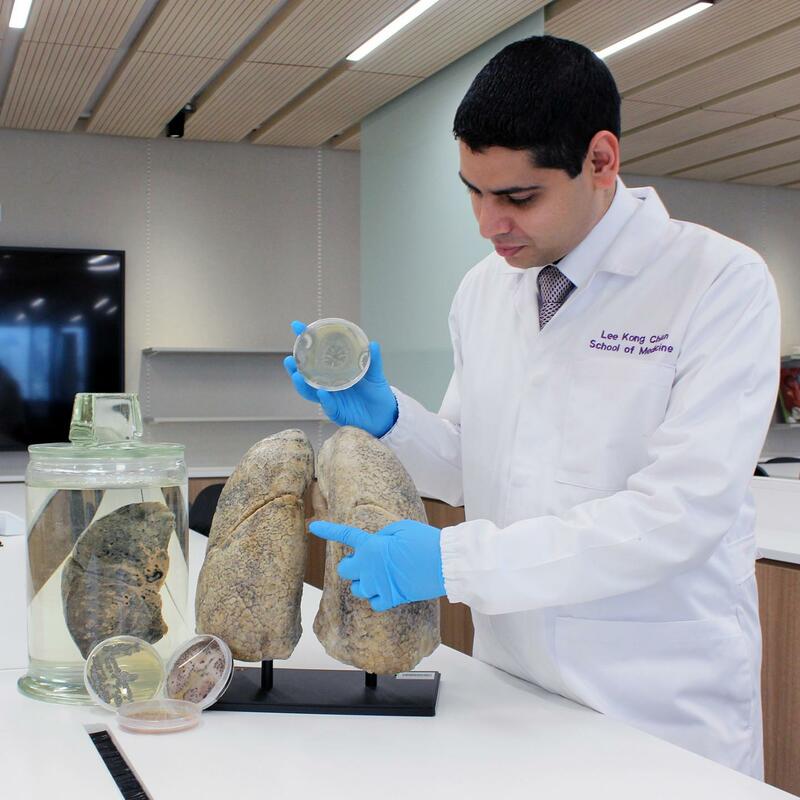 The research is also part of The Academic Respiratory Initiative for Pulmonary Health (TARIPH), a research initiative by LKCMedicine with local and international partners that aims to improve the lung health of Singaporeans. The Singapore team members will next look at understanding further differences in Singaporean patients and the environmental factors that affect bronchiectasis.